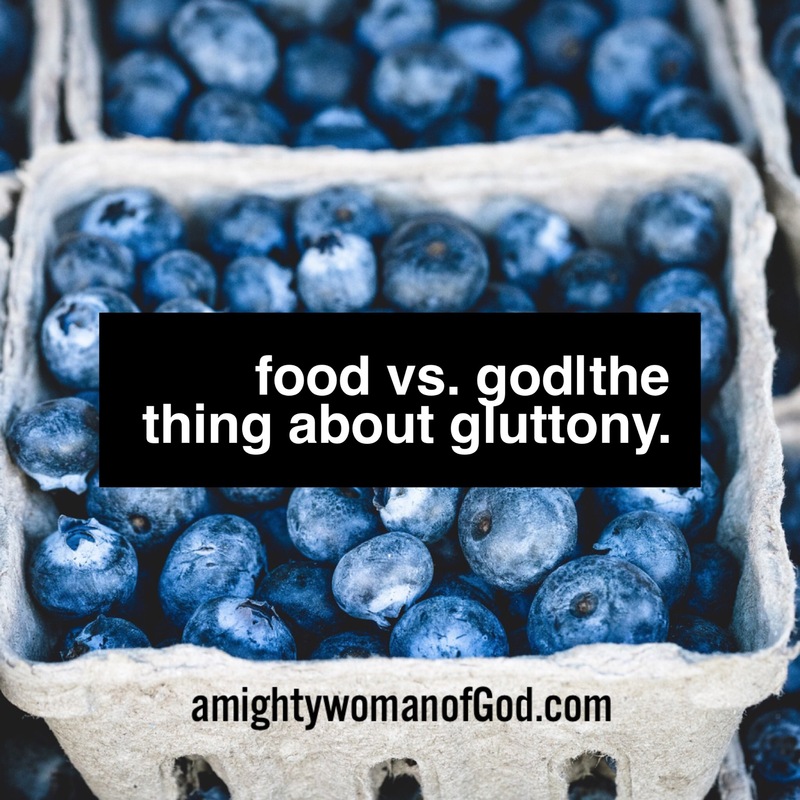 Food vs. God|The thing about gluttony. The definition of gluttony is the act or habit of eating or drinking too much. My love for food, was beyond my love of Christ. While it saddens me to type that, it’s my awful truth. I knew I had a problem with overeating, but I always put it to the side. I knew that I was eating more food than my body needed. Not to mention the constant thoughts of food. I could likely recount all the food I have in the fridge, freezer and pantry. i thought it was normal to awake, and plan everything I was going to eat that day. It was normal for me to run errands, and make a mental food map; where I could reward myself for getting things done. I ate when I was bored. I ate when I was happy. I comforted myself food. Food was my life. I loved everything about it; food being on my tongue, chewing, and swallowing. And, the anticipation when I could do it all over again. I’ve never dealt with obesity, and I eat a plant-based diet. When I went vegan, it fed this compulsion even more. Since I had no family or friends to look to, for maintaining a vegan diet; I depended on the Internet. What I saw were thin, in-shape people, who stuffed their faces. Apparently, vegans had to be sure that they eat enough calories. I hardly needed permission to overeat, but now it seemed as if the permission slip had been signed. It seemed like an awesome problem to have; eating without consequences. Then, comes in Christ offering me abundantly more than I ever wished for. Who loved me off the ground, and assured me that I was loved. Christ convinced me that I indeed had a purpose, and I wasn’t designed to do life;without God. The Savior I ran from, welcomed me with open arms. I can’t even begin to tell you how God’s love for me, changed my life. I scrubbed my social media of language and content that didn’t please God. I deleted my iTunes library, I didn’t enjoy entertainment that didn’t glorify God. I spent uncounted hours with my Bible open, I was divinely awakened. And, everything I saw was beautiful. Daily life was no longer a burden on my shoulders, but rather I became a witness of God’s performances. Last week, God held the mirror up to my face. And, He showed me that I’d de-throned Him. I realized Christ wasn’t first in my life. That God had been the rival of His own gift. I’m not going to lie, it broke me. It confounded me, and it made no sense. That day I threw myself a pity party, and questioned if God even wanted to use me. Then, God showed me example after example of how I preferred food over Him. Things I had forgotten, flashed before my eyes. I could only repent, and pray for victory over this ungodly thing. Gluttony is indeed a sin, but I thought it was harmless. I mean, I wasn’t fornicating or I hadn’t killed anyone. I’ve come to know that all sins are against God. And, God doesn’t have a balance to weigh our sins. They are all deceitful, godless, and powerful. So, then I fasted. Everything came up in this particular fast: my food compulsion, and my thinking God’s goodness relied on my righteousness (more on that later). God pulled back my layers, and it terrified me.I went back and forth between being gracious, and feeling like a withdrawn addict. A lot of moments of praying, studying and worshipping. And, there were precious moments of allowing God’s word and presence to fill me. I learned things about myself, but more about my God. I’m excited to encourage and comfort others with this same problem. I know that God allows us to go through things for own good and, so that through them when can help our brothers and sisters. Please follow my blog, to keep up with my victory overcoming overeating. ‹ PreviousThe Thing About Idols + 6 Clues You May Be Dealing with Idolatry.